Bradley P. Scarp graduated from Seattle University School of Law in 1991. He spent eight years at Madden Poliak MacDougall and Williamson, a firm specializing in maritime law and insurance defense. He left that firm in 1999 with Tom Montgomery to form Montgomery Scarp, PLLC. 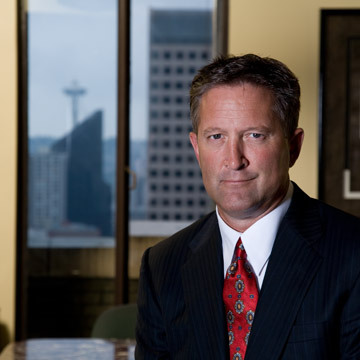 Brad's primary area of practice is civil litigation with an emphasis on railroad and maritime law, Jones Act (FELA), personal injury cases, insurance defense and coverage cases, commercial and contract litigation for which he has tried numerous cases in Washington both in state and federal courts, and in Alaska. Prior to the practice of law, Brad's work experience included a number of years working aboard freighters in Alaska and Bering Sea. Brad is admitted to practice in Washington State, United States District Court (Western District of Washington) and the Ninth Circuit. He is a member of the National Association of Railroad Trial Counsel (NARTC), the Washington Bar Association, and the Federal Bar Association (Western District of Washington). In addition to the law, Brad's interests focus primarily on his family and their activities. He has also achieved minor acclaim locally for his grilled babyback ribs and homemade salsa.